Domesticated from earliest times in Greece and Italy as hunters of wild goats, deer and hares, dogs also served humans as guardians of the house and stock and as faithful companions (and bedwarmers). The Greek hero Odysseus, after ten years of fighting in the Trojan wars, then ten more of struggles to return home, disguised himself as a beggar in order to surprise the suitors who were pressing his wife Penelope to accept one of them in his absence, presumed dead, while she resolutely cherished his memory. 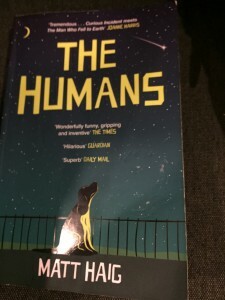 His dog, Argos, at an implausibly advanced age, fallen on evil times, neglected, ill, dozing on a manure heap, pricked up his ears when he heard a familiar step. He wagged his tail and dropped his ears when his master, incognito, had to pass by and ignore the overjoyed dog, who died. 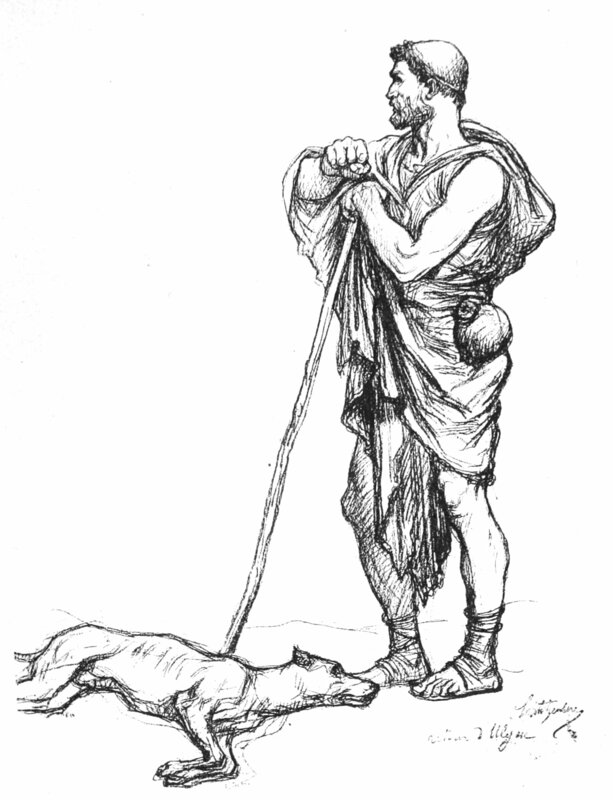 Heartbroken that he couldn’t acknowledge his dog’s greeting without betraying his identity, Odysseus wiped away a tear. 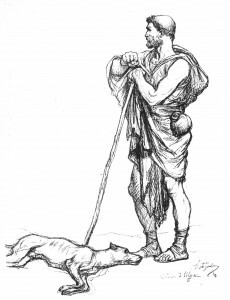 Homer and Hesiod mention sheepdogs and watchdogs: the Molossian Hound of Epirus, mastiff-like, Laconian, was the subject of this post of mine some time ago (the Jennings Dog in the British Museum, via Flaubert and Alcibiades). Xenophon (ca 430-354 BC), better known as a historian and philosopher, also wrote a treatise on the value of hunting as a suitable training for the soldier, for it makes men sober, pious and upright; in this Cynegetikos he extols the Castorian and the Vulpine hounds. The dispositions and ailments of hounds are delineated, and he describes how they should be trained and cared for. If the hare is caught at the first attempt, he says, the hounds should be brought back in to begin the search for another, he says. Psyche, Pluck, Spigot, Hilary, Yelp, Strongboy, Bodkin, all are suitable names, being short and indicative of hounds’ temperaments and qualities. The boar requires a great deal more effort, and stronger nets. Not so much a pursuit as a fight. Dogs are often injured or killed in the boar hunt. Caltrops are useful in the chase, if unsportsmanlike. Darius used them against Alexander at the battle of Gaugamela, Persia. They served to slow the advances of horses, war elephants and humans. The soft feet of camels are particularly susceptible. 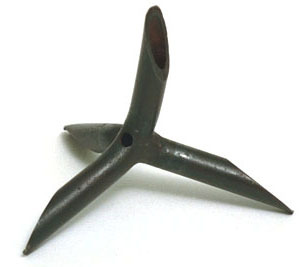 Iron caltrops have been found in Virginia that date from the seventeenth century. In Italy, Umbrian hunters and sheepdogs were renowned as keen-nosed but lacking in courage. Salentine and shaggy-coated Etruscan dogs lacked speed but were keen-nosed. Lucius Columella (born in Cádiz, ended up writing about agriculture – and a treatise on trees — in Italy, d. ca 70 AD) praises in his Res rustica the incorruptible dog, steadfast avenger or defender (rather poorly scanned translation into English here). The shepherd prefers a white dog because it is then unlikely to be mistaken at dawn or dusk for a wolf. The farmdog, on the other hand, has a more alarming appearance when approached by an evil man in daytime if he be black, with a sonorous bark and growl. At night, however, he can approach the crafty thief with greater security. The joints of its feet and its claws, which the Greeks call drakes, should be very large, like its head. The Cú faoil or Irish wolfhound, as its name suggests, was used in the hunting of wolves but also as a war dog. It has an ancient history. Names of kings and warriors often had the prefix ‘Cú’ as a sign that they were worthy of the loyalty of a brave hound. The Irish hero Cúchalain won his name by slaying, when he was a child, the ferocious guard dog of Culain, in self defence, and being taken on as replacement. As early as 279 BC they may have fought alongside Celtic tribes that sacked Delphi. Caesar in the ‘Gallic Wars’ mentions them, and in 391 a Roman Consul named Symmachus writes about receiving as a gift seven ‘canes Scotici’ for fighting lions and bears, to the wonder of all Rome. 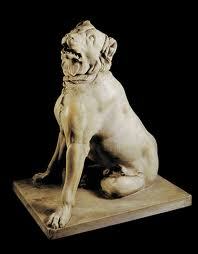 Associated with royalty, these dogs were highly prized. 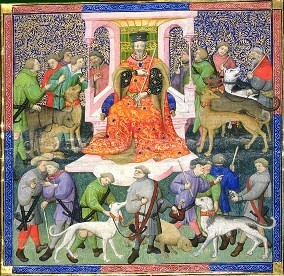 Around 210 King John gave Gelert to the Welsh prince Llewellyn. He is the subject of an ancient folktale motif that’s found in stories from around the world, and the 13C hagiographical legend of the Holy Greyhound, St Guinefort; sadly I’ve mislaid my copy of the superb study by Jean-Claude Schmitt of this bizarre cult, which survived into the 1930s in France, despite the opposition of the church. (The dog-headed saint, or Cynocephalos, is Christopher). 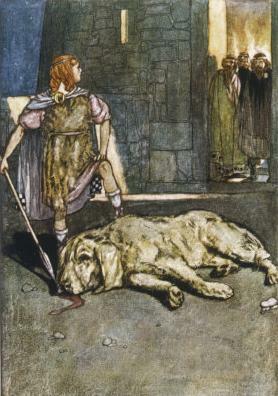 In the legend this faithful hound was rashly killed by its owner, who believed the dog had mauled his son, when in fact it had bravely saved him from a serpent’s attack (or in some versions, a wolf’s). 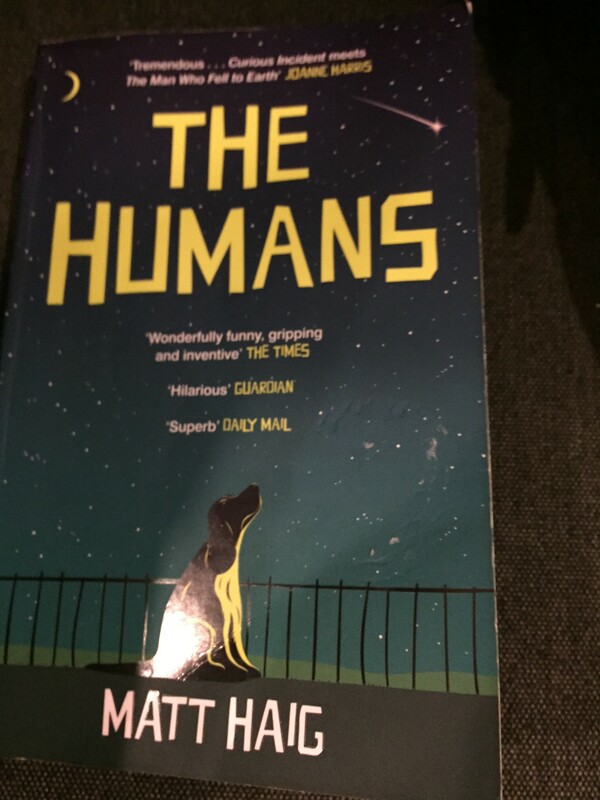 When he hears his son’s cries, he realises his mistake and buries the dog with great reverence. The grave became a pilgrimage site and was believed to benefit the health of children if taken there by their parents. By the way, Lesbia’s sparrow was probably a bullfinch.